It’s not technically my official job, but I do some “developer-esque” relations for the ABC’s Digital Network division. I started doing it because I like it, and it’s been very educational. Your company has products or services it sells, and you’re trying to help people in the community to make better use of them, to encourage new users, and to get an idea about future features that people are seeking. The end goal is to get more people using your product, and be happier while they’re doing so. Your company is trying to be more open about the way it builds things, and to build some community. You’re sharing knowledge about your internal processes and decisions, mistakes you’ve made, and what’s coming up in the future. The end goal is to let people find out more about your environment, get people interested in the products you build, exchange ideas, and perhaps even entice some future employees to join you. My “developer-esque” relations work at the ABC falls firmly in the second camp, and it includes work over the last year such as GovHack 2015, our hackathons, and a new tech talk series we’re starting up. You can sign up here! The first talk is on our internal transcoding system, Metro. The ABC has some really interesting products that millions of people use daily. However, when it comes to who, how, or why we build those products, there is zero external visibility. If you were trying to find information about the ABC’s development team, there really wasn’t anything to see. In an age where almost every company has engineering blogs, talks at conferences or events, and has a community presence, we were falling desperately behind. The lack of information correlates to a difficulty in attracting good candidates. When you have choices, why would you choose the place that you know the least about? So the theory is that by sharing more, we hope to get more people in the door. I’m pretty excited to be part of that. If you are too, then please join us. So, this happened yesterday: Classy Coding! It was one of Women Who Code’s October events with wine, cheese, pastries and a bunch of amazing women working on their own projects, just hanging out and saying hello. 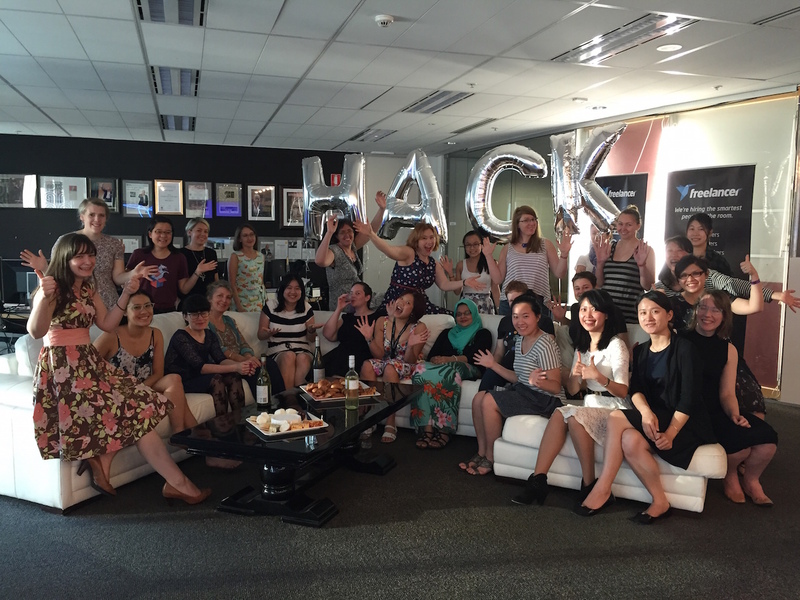 I’ve helped to run Women Who Code Sydney for about a year (along with Lucy Bain and Peggy Kuo), and it’s been a blast. We organise practical hands-on workshops for a variety of technology like Arduino, Golang, Sass, Scala and Swift. Participants spend about 1.5-2 hours working through a tutorial or problem set on their laptops, and can ask volunteers for help if needed, so it’s slightly different to a typical user group: the attendees are expected to code at every event. I know that I personally learn more when I’m forced to do something, as opposed to listening to someone’s experience, and after you’ve done the workshop, everything’s installed on your laptop ready to experiment more at home. Designing a tutorial from scratch takes a lot of work (and rework). You’re not likely to get it right on the first go, so unless you’re aiming for something you can re-use, you are better off going with already published material. They’re a big win. The tutorials have already been tested by hundreds of people before you, and someone has put a lot of effort into designing them. They explain concepts step-by-step probably better than you will first time. It’s important to gauge difficulty and identify what prerequisites are required. Also, sometimes the instructions change and it’s not the same tutorial any more! If you are writing a custom set of exercises or tutorial, give everyone access to the answers. When people start with a working solution, it’s a lot easier to break various bits to see what they do, rather than having broken code and trying to diagnose what needs fixing. This is the thing that people don’t have access to at home. It really helps. You won’t actually cover that much material in a two hour window, so try to pick content that people can try at their own pace – that way everyone learns something. Choose either beginners, or people who are already familiar with programming. It is very difficult to cater for both at the same meetup. State whether people need to understand simple if/else statements, or something more involved like recursion. If people turn up to an advanced tutorial but only know basic programming, they might start feeling like they don’t know anything and get discouraged – that’s the last thing you want! A 10 or 15 minute window is a good amount of time to keep people’s attention (especially after they’ve done a full day of work). Talk for a bit, let people experiment and try what you talked about. Repeat. This is difficult to keep in balance with a self-paced set of exercises, because some people will be ready for the next section before others, but it keeps people focused. This is the first in a series of two posts about a study group I organised for learning Algorithms & Data Structures. This post focuses on the content of the course, which is Princeton’s Algorithms I on Coursera. The course covers a variety of data structures and searching and sorting algorithms from a programmatic implementation angle (as opposed to mathematic proofs; more on that in my second post). Specifically, this one covered union-find, binary search, stacks, queues, insertion sort, mergesort, quicksort, binary heaps, binary search trees and red-black trees, and a lot more. Officially, the course is 6 weeks long, and requires 6-12 hours a week of effort. I think most people in our group underestimated how much time this really takes from your life. The combination of lectures, exercises and assignments was a really good way to cover the material from different angles. If you appreciate structured approaches to learning, this will tick all the boxes. Videos: All of the material is professionally shot and edited. The entire series is presented by Robert Sedgwick, who is a very good lecturer. There is a good level of detail and explanation for each algorithm, especially the animated walk-throughs of each sorting algorithm. You have the option of watching the videos at a faster speed on the Coursera website, and I chose to watch it at 1.25x most of the time, as Sedgwick speaks quite methodically but slower than I am used to. (If you download the videos, you can’t take advantage of this feature, and you also miss the interim quizzes in the videos). It’s very helpful watching videos instead of listening to a live person, as you can pause them and rewind whenever you need to. Slides: The slides are great. Very detailed, well-laid out and with diagrams to illustrate various concepts. The only thing missing from the slides were the animated walk-throughs of how each algorithm works, but you can always re-watch the videos. Interim quiz: at the end of each video, and sometimes in the middle, you have to answer a question about the content you just watched. Discussion boards: The Coursera site includes discussion boards where you can post questions. They’re monitored by people at Princeton who are helping to run the course. It’s a great resource when you get stuck. Auto-marking for assignments: Assignments are all auto-marked for each submission, and the results from marking are really detailed. Each submission is run though lots of tests, and it also analyses your usage of memory & time relative to input (i.e. are you using constant, logarithmic, linear, quadratic time, etc). I found this quite valuable. Real-world examples: Discussions of practical implementations of algorithms, such as a physics engine for particles, or easily finding whether lines/objects intersect, were really interesting. Credibility: Sedgwick is a professor at Princeton’s school of Computing Science. You’re hearing from one of the people who has spent a lot of their life studying and working with algorithms – he’s written several books on algorithms, one of which is used as a reference for the Coursera course (the content is available for free on a corresponding book site). He also found a more efficient variant of Red-Black Trees in 2007, which he discusses in the lectures. Choose your level of participation: You can cut out various parts of the course if you prefer – for example, if you were to only watch the lectures and make your own notes, you could spend 3 hours a week doing this course and still get something out of it. The minimum I’d recommend is watching the lectures and doing the exercises, as the exercises force you to step through the algorithms and work out what they’re doing. Language-independent: It’s possible to complete these assignments in different langauges, as our study group proved. We had people write solutions in Rust, Python, Golang, C# and Scala. However, the majority of them completed in Java to take advantage of the auto-marker for the assignments. Assignments not geared for unit testing: The APIs for the assignments were quite strict – it was almost impossible to test using dependency injection, or trying to refactor one giant (public) method into smaller public methods so you could test them independently. I did write some tests, but I also ended up submitting assignments to the auto-marker to get feedback for some aspects. I’d prefer if the API was less strict so that you can package your own classes, and break things into smaller chunks. The assignments vary in complexity. Some require only 2 or 3 hours; others could take another 10 hours just by themselves. Course schedule: The start date and schedule of the course is advertised as fixed, and quite intense. When they say you need 6-12 hours, they do mean it (and more). In reality, all assignments and lectures have “hard” and “soft” deadlines, and can be submitted up to 6 weeks after the lecture is released. If we had known, we would have built some catch-up weeks into our study group dates to allow people to keep pace. This isn’t Cousera’s fault, but some knowledge that the content would be around for ~3 months would have helped plan a better schedule for our study group. Some content not as relevant: This is a personal preference, but the course covers a lot of different searching and sorting algorithms in depth; in reality only a handful of them are in use by major languages. I’d prefer to concentrate on the ones in use, and not cover the ones that have been superseded. I actually used a weighted quick-union at work yesterday! I‘m as shocked as everyone else. 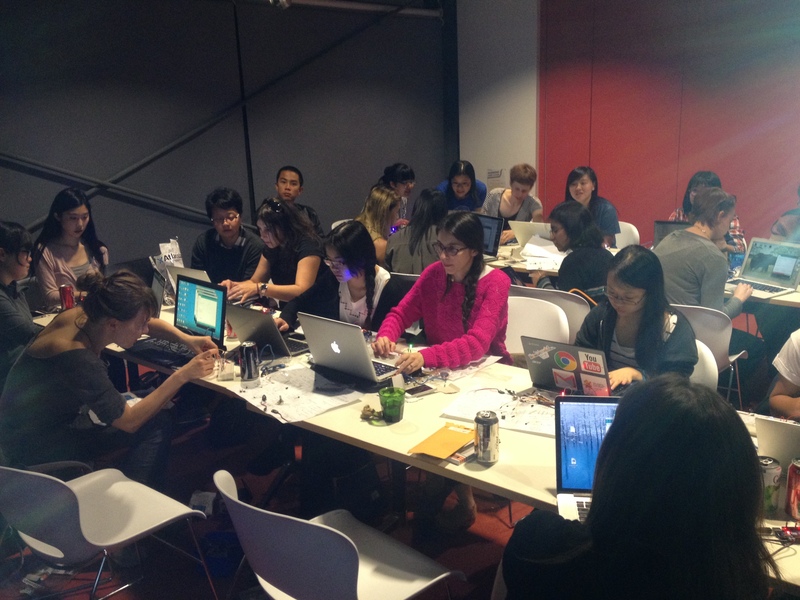 As for Algorithms Part II, I’m sadly stretched working on various things in life, including this blog, Women Who Code Sydney and organising a variety of things with my work at the ABC. However, Caspar Kreiger is continuing the second half starting this week, so get in touch if you’re interested! I plan to pick up Part II in October when it is run again. I’m pleased to announce that the study group will start January 28th. If you’re interested and live in Sydney, read on. We will be doing the Algorithms I course by Princeton university. It involves a series of lectures & quizzes you watch at home, followed by a group meeting every Wednesday. At the group meeting you can ask questions about anything you didn’t understand, and start to go through coding exercises. If you are unsure of Java syntax, please read up on a quick syntax guide before starting the course. Atlassian has kindly agreed to host our meetings. Their office is Level 6, 341 George Street Sydney. The building entrance is off Wynyard St.
We’ll meet on Wednesdays at 6:30pm (please be prompt). The course is 6 weeks and runs from January 28th until March 4th. There will be an optional week after the course ends to practice answering technical interview questions. The course is free if you attend 5 out of the 6 meetings. You can skip one meeting without a penalty. Everyone will be asked to pay 6 x $10 per meeting at the first meeting, a total of $60. For every meeting you attend, you’ll be credited $10 back. This is mainly an attempt to identify the people who really want to participate, and to motivate people to stick with the group. I’m not teaching this content, I want to learn it and would like other motivated people around at the same time. The study group will be limited to 15 people. The first 15 people who contact me (@daphnechong) and bring a refundable $60 to the first meeting will be eligible. 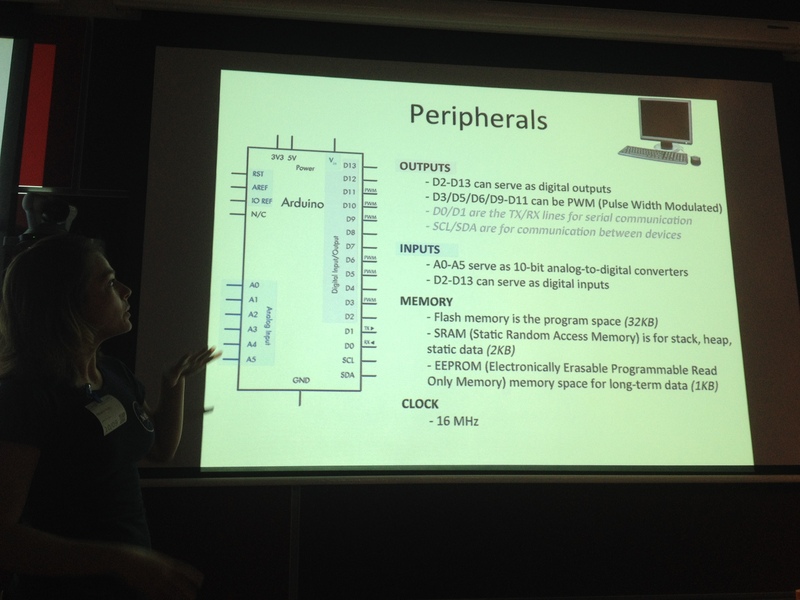 Last September, Women Who Code Sydney ran a Learn Arduino event. I’m generally not very keen on hardware, so I hadn’t bothered to investigate Arduino in depth, but this blinking green light from the workshop was one of the most exciting things I’d seen in ages. It was programming in physical form: I’d written the code, sent it to the motherboard, plugged in the wires and resistors to control the current, then seen something in my environment that I could actually touch and change. Arduino has been around for a while. It is a small version of a computer with very simple inputs and outputs, and that’s what makes them really fun to play with. There are lots of different input sensors you can use, like temperature sensors, movement, infrared, light. It’s fairly inexpensive to get a basic Arduino kit, as cheap as $30 depending on where you get it from. Atlassian kindly sponsored our event and donated 20 starter kits which included the basic Arduino board, and a whole lot of extra sensors to play with. Our host, Natalia Galin did a phenomenal job preparing for the event, even down to these cheat sheets with components separated out and nicely labelled, which made it easy to work on our tasks. 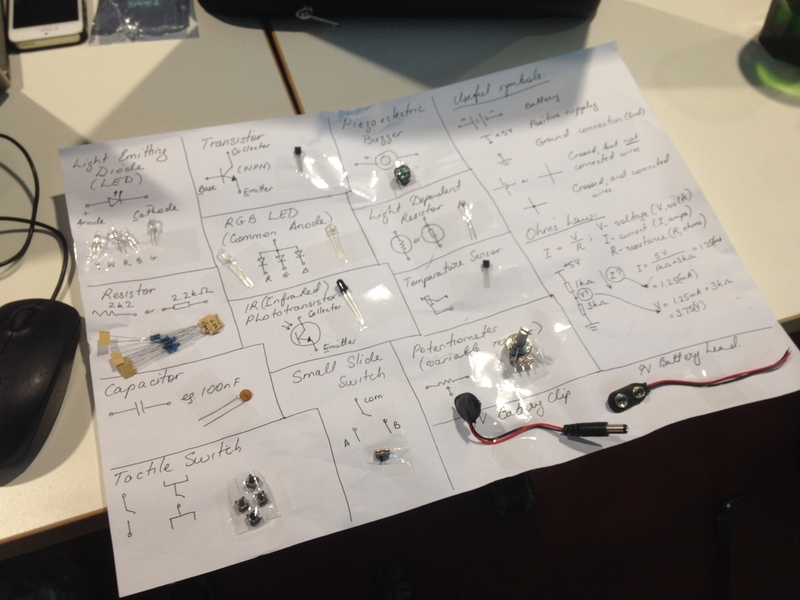 First up was a crash-course on electronics, and how the Arduino’s breadboard circuitry works. Then a series of programming tasks to connect up the wiring so that lights work, and using physical switches to turn lights on and off. It was addictive! We were limited by how many kits were available, but we had around 25 people attend the workshop, and the atmosphere was great. A huge thanks goes to Google for sponsoring the venue and catering for the night, and Atlassian for the Arduino kits.